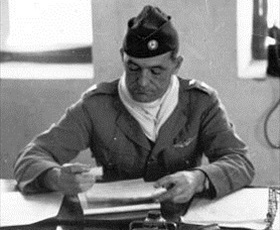 On this date in 1942 Gen. Claire Lee Chennault was appointed com­mander of China Air Task Force (CATF), replacing his origi­nal (offi­cially dis­banded) com­mand, the Amer­i­can Volun­teer Group (AVG) of “Flying Tigers” fame. The AVG volun­teer group of U.S. Army, Navy, and Marine flyers had been created by Chin­ese Nation­alist leader Generalis­simo Chiang Kai-shek and sanc­tioned by Presi­dent Franklin D. Roose­velt prior to the entry of the U.S. into World War II. In 1942 the three AVG Flying Tigers squad­rons were absorbed into the U.S. Army 23rd Fighter Group (a com­po­nent of the CATF), which in turn was absorbed into the U.S. Four­teenth Air Force, with Gen. Chen­nault as com­mand­er and his fighter air­craft retaining the dis­tinc­tive shark-mouth nose art of the ini­tial volun­teer unit. The core group of 99 AVG volun­teers first saw com­bat in China on Decem­ber 20, 1941, twelve days after Pearl Harbor, when an AVG squad­ron engaged ten Japa­nese Kawa­saki bombers, shooting down three or four of them at the cost of one of theirs, which crash-landed when the plane ran out of fuel. It was the first Allied vic­tory of the Paci­fic War. Chen­nault’s pilots went on to destroy nearly 300 enemy air­craft while losing only 14 pilots on com­bat mis­sions. Chen­nault’s inno­va­tive “dive-and-bomb” com­bat tactics, com­bined with the V12 single-engine Curtis P‑40 War­hawk’s heavy arma­ment (six Browning machine guns and up to 2,000 lb of bombs), pilot armor, self-sealing fuel tanks, and sturdy all-metal con­struc­tion, con­tri­buted to the Flying Tigers’ dis­tin­guished se­rvice in Burma and China. (The P‑40 was the third most-pro­duced U.S. fighter [13,738 were built], after the North Amer­i­can P‑51 Mus­tang [15,000‑plus] and Repub­lic P‑47 Thunder­bolt [15,660].) The iconic sharks­mouth P‑40 remains among the most recog­ni­zable of any indivi­dual com­bat air­craft of World War II. 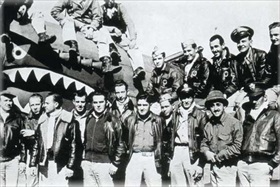 U.S. air­men and the media con­tinued to use the “Flying Tiger” name to refer to U.S. Army Air Forces (USAAF) units in China to the end of the war. Left: The American Volunteer Group ini­tially trained at an RAF base in Burma with the mis­sion of defending belea­guered China against in­vading Japa­nese forces. AVG pilots like these shown in this February 1943 photo were recruited under presi­dential author­ity from the U.S. armed ser­vices. Ground crew and head­quarters staff were like­wise mostly recruited from the U.S. mili­tary, along with some civilians. 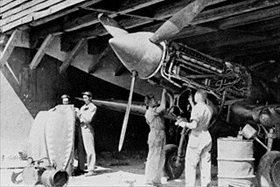 Right: A ground crew services a P‑40 War­hawk of the 23rd Fighter Group at an air­field in China, 1942. P‑40 War­hawks came off a Curtiss-Wright assem­bly line in Buf­falo, New York, which produced P‑40 Toma­hawk IIB models for British Com­mon­wealth squad­rons in North Africa and the Middle East. An RAF squad­ron was the first Allied mili­tary avia­tion unit to fea­ture the sharks­mouth war­paint, copying simi­lar markings on the noses of some Luft­waffe Messer­schmitt Bf 110 twin-engine fighters. 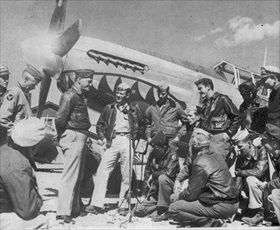 Left: In this 1942 photo Chennault converses with pilots of the 23rd Fighter Group. 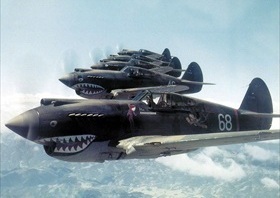 In the back­ground is a P‑40 War­hawk bearing the dis­tinc­tive sharks­mouth nose art from AVG days. Right: Claire Chennault was a 44-year old retired U.S. Army Air Corps offi­cer when he arrived in China in 1937. He even­tually became direc­tor of a Chin­ese Air Force flight school cen­tered in Kun­ming, south­west China, before being appointed com­mander of China Air Task Force. In this May 1942 photo, he wears a U.S. Army briga­dier gene­ral’s star on his left shoulder but Chinese insignia otherwise. Right: AVG squadron flight leader Robert “R. T.” Smith standing next to his P‑40 War­hawk fighter, Kun­ming, China, May 23, 1942. 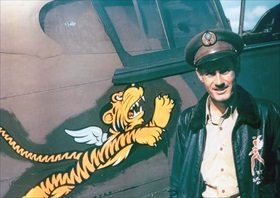 Note Smith’s Nation­alist Chin­ese em­blem on his cap and the “Flying Tigers” insig­nia on his air­craft. The insig­nia was created by the Walt Disney Company.